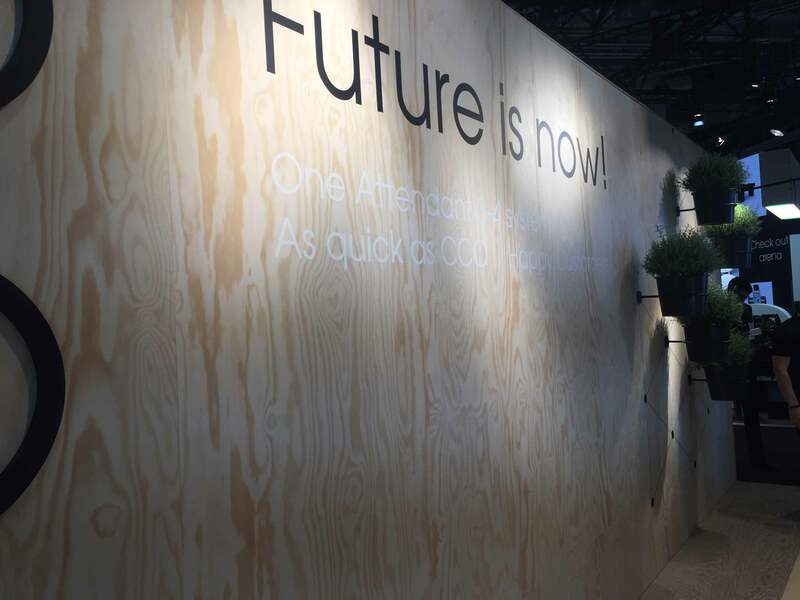 Yes, as the Beach Boys’ sang, ‘wooden it be nice’ to see some creative use being made of wood in the exhibitions halls of our industry? EuroShop 2017 was, in that regard, very nice. There was wood deployed across the halls in just about every conceivable role, from flooring to walls, and structures to design details. 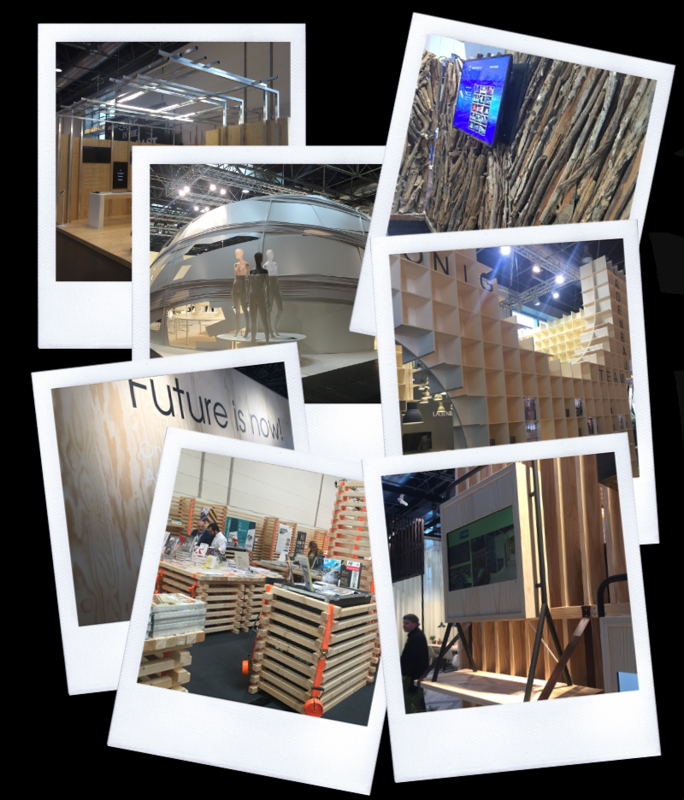 There was also a huge variety of wood being used across the show, with stands featuring beautifully finished laminates, unfinished wood composites, rough-hewn timber and even driftwood in their construction. We would expect to see stands with a high level of detailed finish, and where wood is concerned this means a smooth surface, crisp edges and a showroom appearance. 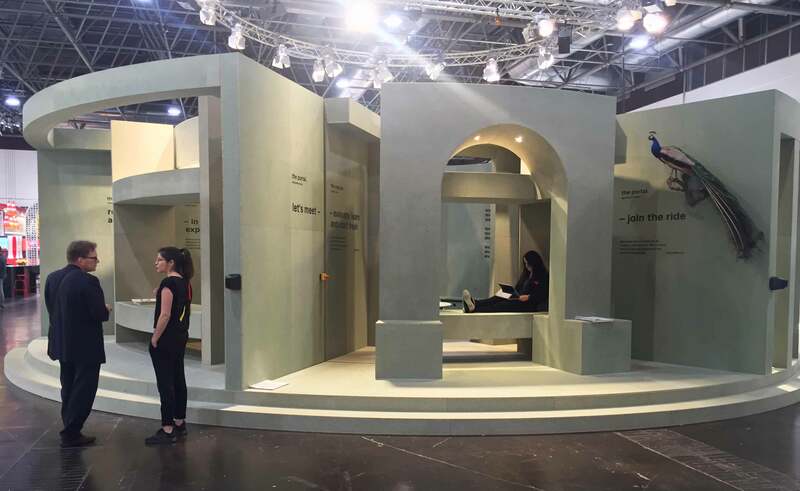 This year’s EuroShop had some markedly different applications. One stand in particular used large sheets of particleboard to create the structure of the stand, but the sheets were all left raw, with no finish to the edges and the joints and fixings were visible. Because the designer had themed the stand around this unfinished look, and created eye-catching counterpoints, even including some taxidermy on display in the form of a stuffed peacock on one wall, the rawness of the construction did not jar with the rest of the show. 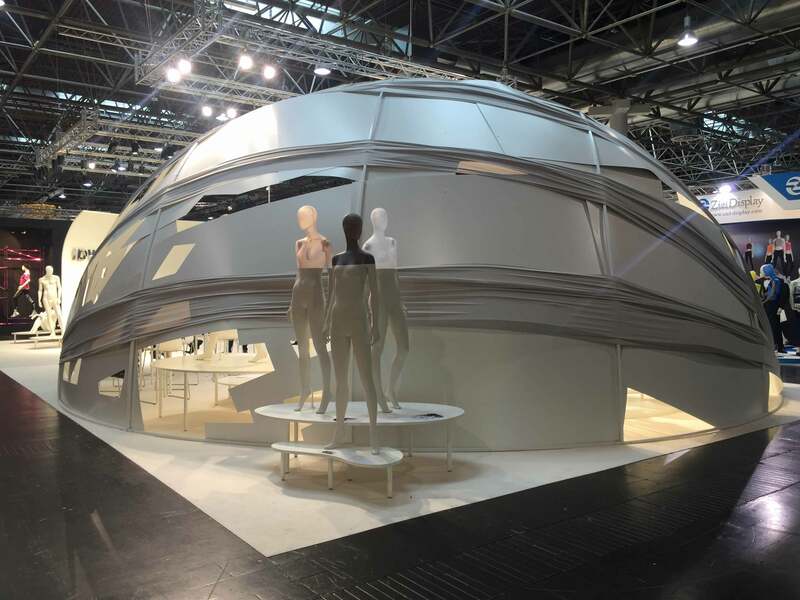 As we turned the corner we were faced with a very clever dome structure, the main shape of the quarter sphere was fabricated as a framework and woven between the beams were thin sheets of laminated board or plywood, still at full sheet size. Painted to match the rest of the stand their hard edges were softened by wrappings of matching coloured fabric. The concept was very simple but the use of the plywood to give the quarter sphere a sense of solidity was striking. Inside the dome an array of mannequins, the company’s stock in trade, were displayed, overall a simple but stunning exhibition stand. 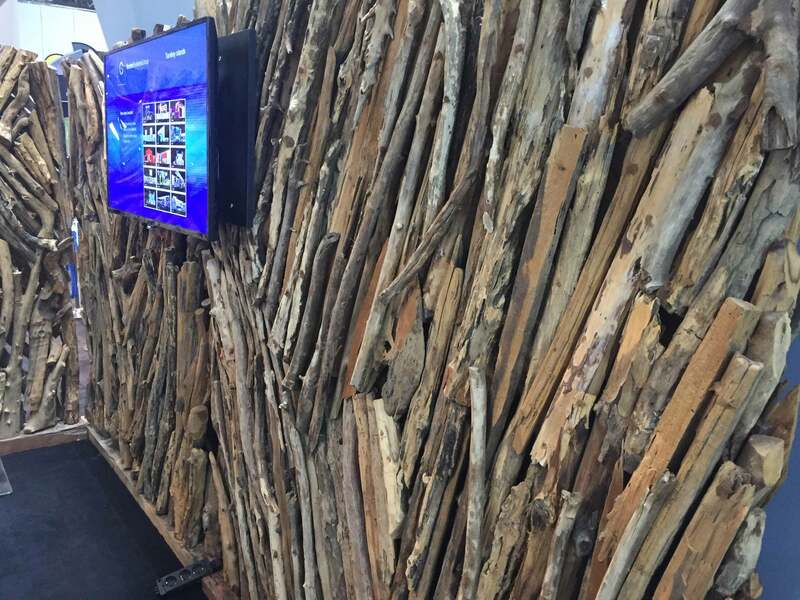 Driftwood and rough timber was in evidence, the former was used to create a driftwood wall effect on one stand that certainly stopped visitors in their tracks. There was little distraction on the stand other than the plasma screen, which contrasted with the natural materials and focused attention on it and its presentation. 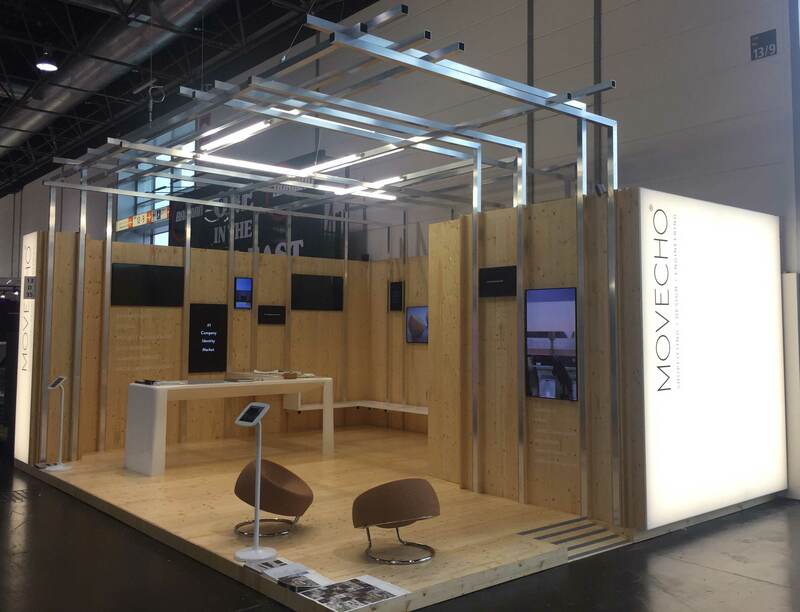 It is commonplace for stand design and build companies to use traditional flats, a timber framework clad with a vinyl or fabric to create the solid walls of an exhibition stand. 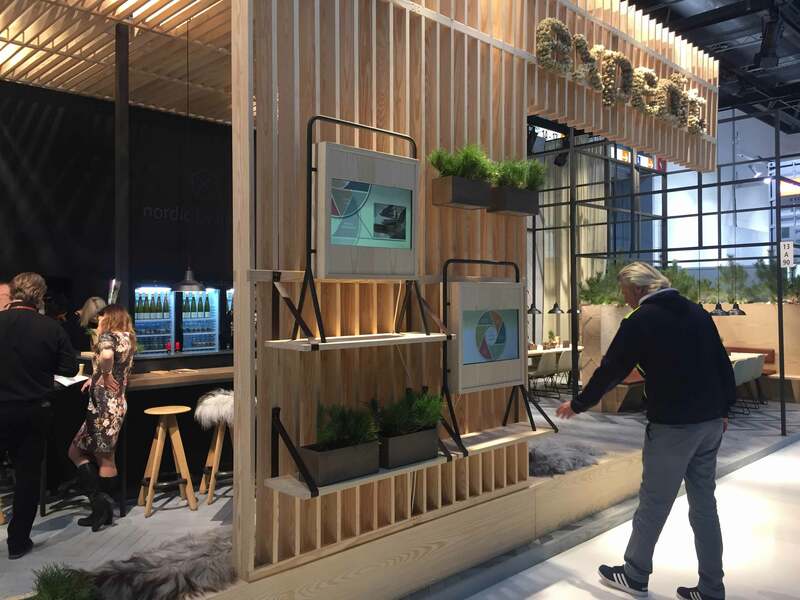 There were several examples, at EuroShop, of bare timber frameworks forming the structure of the stand but the frame, rather than being clad, were left as bare timber. 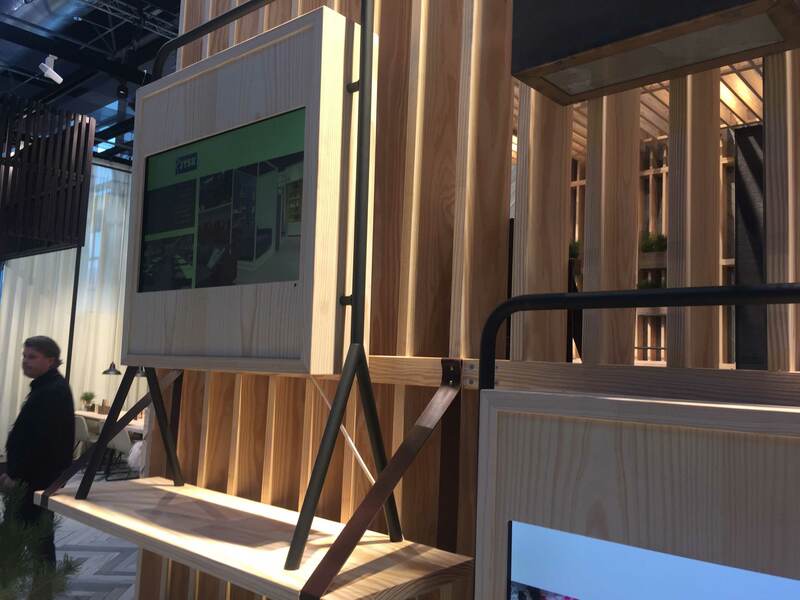 One stand used the frame to hang their products from and another used timber to create display plinths and displays. Of particular interest to a graphics company like ourselves, was the use of print direct onto the timber itself. The smooth pattern of the grain contrasted beautifully with the crispness of the lettering. Another aspect of the timber and graphic combination was how a couple of stands had used the timber to frame large-scale, high-resolution graphic sections showing products. This tied the walls of the stand into the rest of the structure as well as clearly showing what the exhibitor was there to share with the visitors. 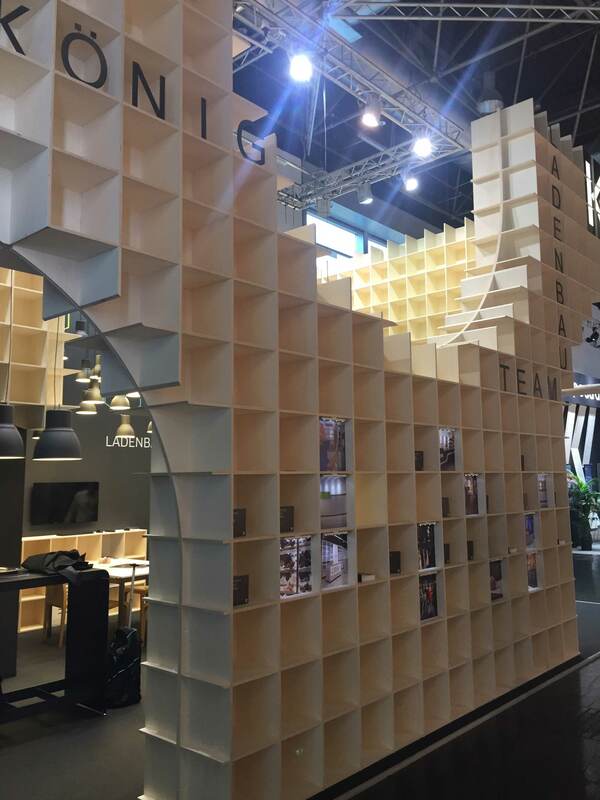 The versatility of wood was highly in evidence and when combined with other materials such as metalwork, technology and colourful graphics the combination made for a compelling spectacle that is sure to making an appearance in exhibitions in the UK over the coming months. Now, how do we get timber through our roll-fed printer?